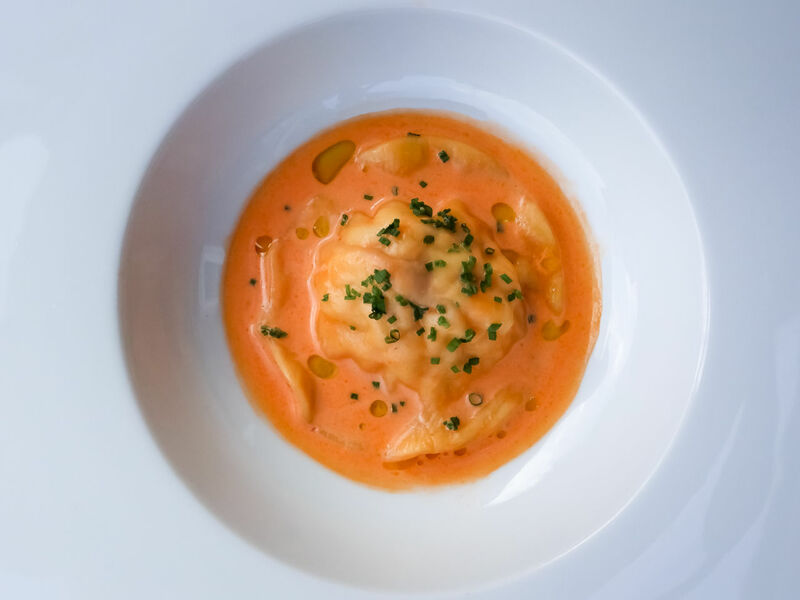 Lobster is one of those little luxuries in life that is great to spoil yourselves with from time to time and this recipe uses every single bit of the lobster including the shells to make an amazing sauce. This recipe is quite labour intensive but the rewards are worth it given a little time and effort. This recipe will serve 4. Firstly make your pasta. Place the flour in a bowl with a pinch of salt. Crack and whisk the three eggs and then slowly add to the flour mixing with your fingers. Keep working the dough until it comes together. Take out of the bowl and kneed on a floured surface until smooth and springy. Cover with clingfilm then place in the fridge until needed. In a large deep pan bring well salted water to the boil. Drop in the lobster and cook for 7 minutes for the first pound then 3 minutes per pound thereafter. Once cooked immediately plunge in to iced water until completely cool. Pull away the head of the lobster then lay the tail flat and cut down the middle to release the meat. Cut the head straight down the middle. You may wish to clean out the head from any unappetising contents! Using a strong knife crack the claws and remove the meat (try if possible to keep the meat as whole as possible but don’t worry if you can’t. Place the meat in a bowl and cover until needed. Take your prawns and blend with the cream. Season with a little salt and pepper then cover in a bowl and place in the fridge. In a frying pan add a little olive oil then add the shells, onions, fennel and tomato puree. Cook for a couple of minutes then flame with 50ml of brandy. Add your wine and cook out for a minute before adding the stock. Cook for 10-15 minutes to allow the flavours to develop. Season with a little salt and pepper. Place everything in a food processor and blitz until smooth. Once done pass through a fine sieve back in to a clean pan. Add the cream and finish with butter and lemon. Check the seasoning and add more if required. Take the pasta dough out if the fridge and divide in 2 then sprinkle with a little flour. Put the pasta machine at the widest setting and roll through the pasta taking it in to a narrower setting each time you pass it though. Make sure you dust it each time to prevent sticking. Repeat the process with the second pasta dough. Once you have the pasta paper thin its time to make the ravioli. Lay one sheet of pasta on a flat surface. Take a teaspoon of the prawn mixture and place equally spaced on the pasta. Put a slice of lobster in the middle then some more of the prawn mixture on top. Brush a little beaten egg around the mixture and then carefully lay over the second sheet of pasta. Press around the mixture ensuring there are no air pockets. Then cut out the ravioli with a scone cutter. Bring to a gentle rolling boil some salted water. Carefully place in your raviolis and cook for 2-3 minutes or until the raviolis float to the top. Place your raviolis in to a bowl and pour over some of your sauce and then finish with a little chopped chives.